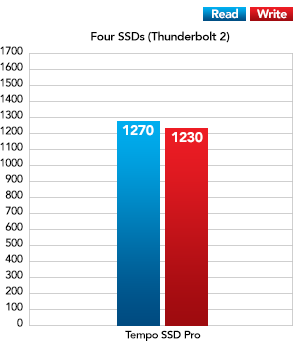 If you’ve been thinking about fast, bootable storage, you’ve read the stories and seen the reviews; SSDs are hot right now. Not only do they offer tremendous performance and easily outperform hard disk drives, they are more reliable, their prices are dropping and you can get more capacity than ever. 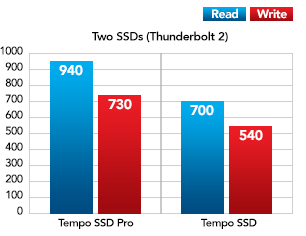 If you’ve got a Mac Pro® or older Windows® desktop computer, you could just get a couple of 2.5” SSDs (plus necessary adapters) and install them in some empty drive bays (if there are any) and be done with it—but the 3Gb/s SATA interface in your computer won’t support fast 6Gb/s SSDs at full speed. You could also get a 6Gb/s eSATA adapter plus external mount SSD storage, but they come with the excess baggage of power adapters and cable clutter. 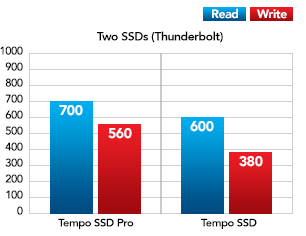 Sonnet engineered a great alternative—Tempo™ SSD. It's a fast 6Gb/s SATA PCI Express adapter card that enables you to attach readily available 2.5" SSDs and install the assembly neatly into a single PCIe slot, no cables or drivers necessary. 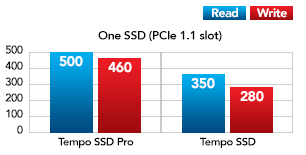 Unlike other PCI Express SSD cards that rely on proprietary, premium priced SSD modules, Tempo SSD uses standard 2.5" SATA drives that you choose. You get to select from the widest variety of SSDs, and buy the ones that best suit your capacity and performance needs while working within your budget. 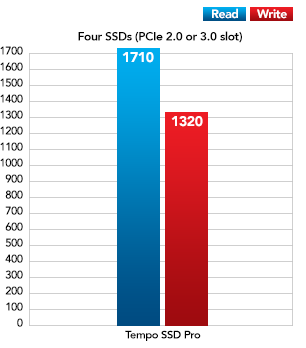 Because 2.5" SSDs are readily available, you’re not tied to one retailer or SSD manufacturer should you decide to upgrade to higher capacity, faster SSDs. 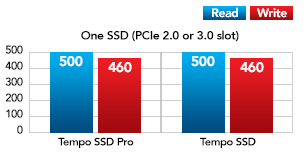 Tempo SSD features a unique modular design that grows with your needs. Out of the box, this Sonnet solution is a half-length, full-height card to which you attach one SSD. It’s small enough to fit in most spaces, perfect for installing a single SSD into your system. With the included extension plate attached, the Tempo SSD is transformed into a full-length card to which you can install an additional SSD. 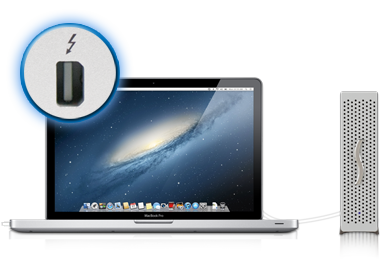 Adding the second SSD allows you to improve performance or data security by exploiting OS X® or Windows® RAID features. This card uses a fast 6 Gb/s SATA controller chipset and PCIe 2.0 x2 interface to deliver read speeds up to 660 MB/s from a pair of SSDs configured as a RAID 0 set. AHCI compliance ensures installation of the card is simple—attach your SSDs with provided screws, mount the card in an available PCIe slot, and turn on your computer—the necessary drivers are installed automatically. Drive health monitoring is supported through S.M.A.R.T. data reporting. 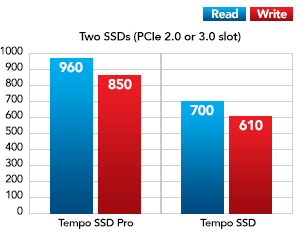 Add More to the Plate: The included extension plate allows you to add a second SSD to expand your storage needs. 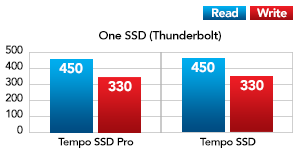 Tempo SSD cards sold before mid 2014 have support for only 5V devices. Cards with serial numbers Bxxx03334 and greater also provide 12V and 3.3V to the SATA power connectors. 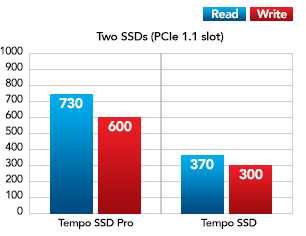 Xserve supports only one SSD. Does not currently boot a Mac with Thunderbolt 2. Sonnet is working to identify the issue. Sonnet/Marvell driver required for HP Z820.